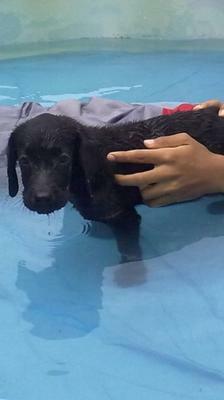 Rocky is a purebred American Labrador Retriever who was born in early April 2011. He is a very good companion and he makes a good family pet as well. He greets me with a wagging tail. He always comes to me when ever he gets an opportunity and gives me some wet kisses. He swims in our swimming pool once every week and goes with me for a walk for 15-20 minutes every day. He fetches his favourite frisbee in the evening and also plays with his pal goat, Kaka in the backyard. Rocky plays with small children and likes to enjoy the company of loving people.